Regardless of when you are scheduling a visit to the National Grand Canyon, your visit will require some basic planning and comprehensive preparation. In this guide, you will learn basic information about the park, facts about the location of the National Grand Canyon, places to go within the area, and various activities that may be pursued. The Grand Canyon is a location that truly puts into perspective the overall beauty and grandiosity associated with Mother Nature. This natural wonder is a philosophical “window” into the geological and cultural past of the United States. It was one of the very first national parks highlighted throughout the United States and is considered to be one of the most beautiful natural treasures within the country. Not only do the breathtaking views enrich the senses, the immense size and expanse of the National Grand Canyon ignites the imagination and instills a sense of thrill and adventure to all who visit. Continue reading this travel guide for important information that will help you plan and prepare for this amazing trip. The National Grand Canyon of the pristine waters of the Colorado River is a canyon that is one mile deep. This canyon actually bisects the national park into two regions – the South Rim and the North Rim. While the average length across this amazing canyon is 10 miles, it actually takes a whopping 5 hours to drive between the North Rim and South Rim because that distance totals an amazing 215 miles! The South Rim is the most popular destination at the National Grand Canyon because it is open all day and night, each and every single day of the year! If you plan to travel to this region of the park during the spring months, summer months, or the fall months, a reservation should be made. If you are planning a summer trip, you should know and understand that you will run into a lot of congestion and may experience parking issues; however, there is a free shuttle bus that is in full operation in the area of the Grand Canyon Village. To save yourself time and money, you should opt to take this bus. The National Grand Canyon is location in the northwest corner of the State of Arizona. It is in close proximity to the borders of the States of Nevada and Utah. In the canyon, flows the Colorado River. This amazing river drains water from a total of seven different states; however, the section within the national park drains water from Arizona. As mentioned previously, this river breaks up the park into the North Rim and the South Rim. Each of these regions is extremely different in terms of the natural scenery, the overall climate, and the plant/vegetation life. You should make every attempt to visit each side; however, this will take a bit of planning and preparation. 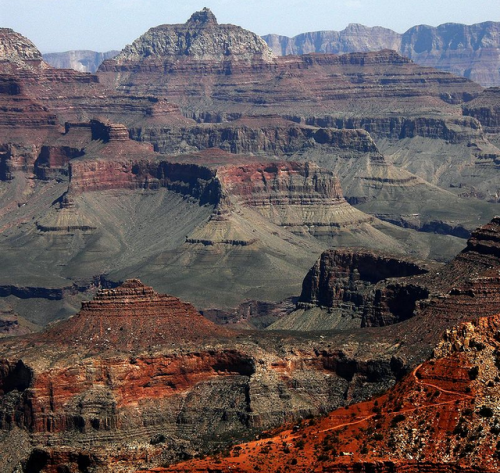 Thank you for reading the first installment to our series, “Planning a Trip to the National Grand Canyon”. This week, you have learned some basic information about the National Grand Canyon and the general location of the national park. Be sure to visit us next week to learn about the places that you may go once you arrive to the park. Read Part 2 Here.